To better serve the needs of the membership, the Pro Shop was relocated in 2001 into a completely renovated 5,000 square foot complex, located adjacent to the first tee. 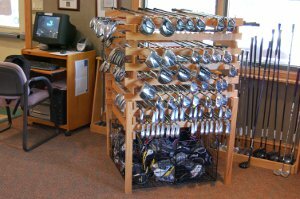 The fully-stocked Pro Shop offers a wide variety of golf equipment, apparel, golf balls, and accessories to club members. The Golf Professional staff is available for personal or group golf lessons and offers a wide variety of services, such a custom club sizing. The fleet of 75 golf carts (all with roofs) is meticulously maintained.